(SPOILERS) Ten minutes. There were more jaw-dropping events that took place during 'Out of Time' in the final ten minutes than most shows have in an entire season. When showrunners promised a game-changing episode they were not kidding. The Flash once again made their case for the best comic book-based show in history. After a month-long break, The Flash returned with an episode that looked more like a season finale than episode 15 of season one. Clyde Mardon's brother Mark (Liam McIntyre) is on the rampage looking to avenge his brother's death by Detective Joe West. McIntyre smolders and menaces as the Cisco-dubbed Weather Wizard. Despite the classically goofy name, he causes some serious damage all over Central City trying to get to Joe. The special effects on the show, or on television for that matter, have never been better. Joe and Barry are driving when they realize they're being followed by the Wiz when he releases a bolt of lightning from above them. The sequence in slow-to-fast motion is exhilarating. As is the ending which evokes a number of feelings and gasps. The episode was structured so masterfully that it first recapped how the Mardon brothers got their powers, then lulled you with the awkward double date of Barry/Iris/Linda/Eddie, then shocked you in the middle with the villain on the loose, and the finally dropped some bombs at the end. What does it all mean after Barry went back in time? How much remains the same? Leading up to it you had Captain Singh possibly paralyzed in the hospital after taking a direct hit from the Wiz while saving Joe and Eddie was upset about Barry and Iris's cozy relationship. Wiping the mouth of your "foster brother" while he's on a date with someone else could seem a bit suspicious. Speaking of suspicions, Cisco's continued investigation into Dr. Wells possible involvement into the death of Barry's mom led him to find evidence that he faked the whole containment of the Reverse Flash. When Wells walks in on him replaying the holographic image of RF in the containment unit he knows the truth is out. What follows is so tense, unnerving that Tom Cavanagh has never been more creepy or evil. Despite the two sharing some laughs watching a film together at the beginning of the episode. Wells reveals his real name Eobard Thawne and he is not from this time. He's "stuck" as a matter of fact and has been for 15 years. He's just trying to get back and thinks Barry is the key. Eddie is a distant relative of the time-traveling speedster who after telling Cisco he's the closest to a son he's ever known phases his hand through his heart. Oh, the feels have never been so wrenching. Cisco knew too much and it cost him his life and the death resonated. The brilliant kid with a penchant for naming meta-humans and providing comic relief just had his heart literally crushed. As sorrowful as it was seeing Cisco go, the opposite feelings surrounded Iris expressing her love for Barry. They finally kissed and it was worth all the love triangle stuff because it seemed more passionate and real. However, it came on the brink of a Weather Wizard-induced tsunami. In order to try and save Central City, he had to try to run back and forth to create enough wind to fight the coming surge of water. He went so fast he ripped through time and space. He ended up right where he started at the start of the episode. So everything that happened; the kiss, Cisco's death, Singh's injury, even Weather Wizard's murder spree hadn't occurred yet giving Barry a chance to the change the outcome. He can stop the Wiz, saving Joe, Singh and the city. He knows Iris's true feelings. It's all shaping up to follow the path created in the comics. Iris is destined to be with Barry. Wells revealing his Eobard should lead to him becoming the supervillain Professor Zoom opening the door for Eddie to become the Reverse Flash. Does Cisco make it out alive this time? After all, in the comics he becomes a hero himself - The Vibe. 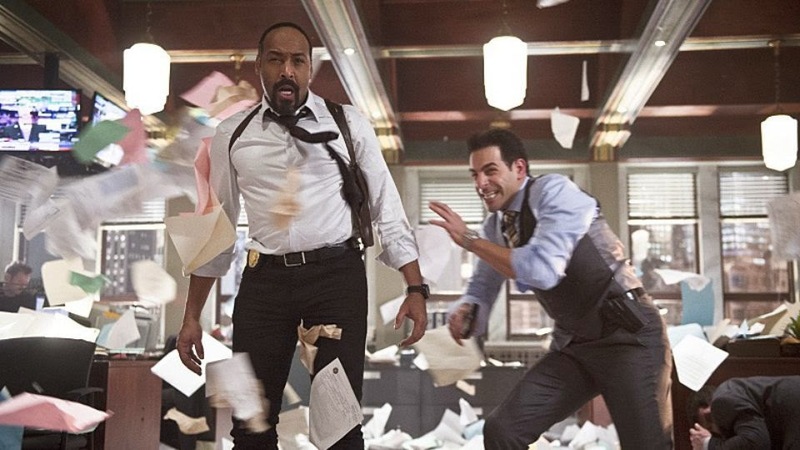 The amount of subplots spinning out of the episode that have consequences for the rest of the season is partly why The Flash proudly wears its comic book heritage on its sleeve. It knows where it wants to go and has its own way of getting into that canon that fans want to see. The Flash continues to thrill without leaving anything on the table.